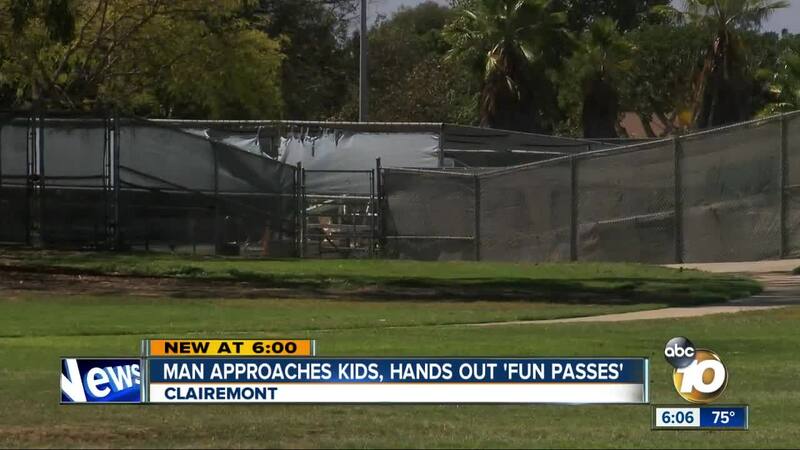 SAN DIEGO (KGTV) — Some local moms are describing a disturbing encounter between their kids and a stranger at a park in Clairemont. Last Friday around 4:30 p.m. at the South Clairemont Community Park, Melissa says and four other mothers were at the park with their kids. A group of some five kids, including her 7-year-old son, were within sight and hanging out near a wall adjacent to a skate park. The next thing she knew, one of the moms got up abruptly. "My friend got up and started walking to the back of the park, and she was walking with purpose," said Melissa. Melissa says the kids were still together, but there was a stranger among them: A 6-foot tall, middle-aged man who took off when the mom ran up to them. "We were freaked out. A lot of weird red flags," said Melissa. Melissa said it played out in just minutes. The man was able to get the kids to move several hundred feet to see his German Shepard. "He was getting the kids to play with his dog and getting him to do tricks," said Melissa. According to the kids, the man gave them an offer. "He mentioned something about magic wands he had in his car that he wanted to show the kids," said Melissa. Before that could happen, he had something else to show and hand to them: A card dubbed a "Universal Fun Pass," allowing them to "live the life" they deserve, and even experience "euphoria." A police report was filed. Andrea Schroeder, a mother of two, got wind of it. "To me, he sounds like a danger to our children," said Schroeder. She posted details of the incident on the Nextdoor app in hopes of getting the word out about a not-so-fun encounter. "It's scary but I think it's also a wake-up call, and we have to be hyper-vigilant," said Schroeder. Melissa and other moms plan to approach nearby schools about more stranger danger training.